The TWIST project (Training WIth Stakeholders – applying EU drug and addiction research) is designing a training strand on using addiction research and knowledge, with the participation of the target audience (early stage professionals and stakeholders from multiple sectors), to be delivered within the frame of the forthcoming Lisbon Addictions 2017 conference (LxAddictions17, on 24-26 October 2017). During the evaluation of first edition of the LxAddictions Conference in 2015, a demand was detected to go beyond the usual conference communication formats, and complement the programme with an integrated training event to explore a selection of “hot” drug and addiction topics in-depth, and build capacity among different stakeholders, using novel interactive dynamic learning formats, knowledge and experience exchange, and multi-sector networking environments. The TWIST programme will meet this need through a two-day training programme, aimed at early stage drug and addiction professionals, embedded within the scope and programme of LxAddictions17. Target audience. TWIST brings together over 140 early stage drug and addiction professionals – from academic, clinical and civil sector organisations – with experts from research and non-research stakeholder groups. We expect participants to come from a wide variety of European and neighbouring countries, and are working to ensure balance and diversity in terms of geography (including participants from lower income and less research-intensive EU and neighbouring countries), ability gender and career stage. An online training development survey and forum discussions with the stakeholder groups on the training programme content, formats and learning outcomes through the TWIST website. 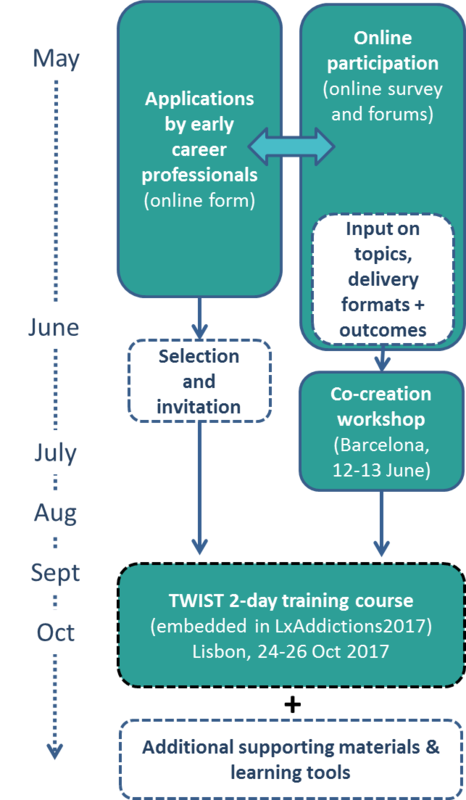 A co-creation workshop in Barcelona*, aimed at distilling the input from the TWIST online platform, and define meaningful training pathways within the programme of LxAddictions17 – invited participants will represent a range of stakeholder profiles, sectors and geographical areas. * A limited number of places at the co-creation workshop (12-13 June in Barcelona) will be made available to people contributing significantly through the development survey (with past submissions taken into account retrospectively). TWIST will cover the flight, hotel, daily lunches and conference fees for training programme participants, and the application process is now open. Participants will be required to engage in the participatory process to input in the design of the training strand via the online survey and forum. The closing date for applications is 30/06/2017.